The Royal Canadian Legion is reaching out to modern veterans, military members and families through a new partnership with Directorate Military Family Services (DMFS). Though the two organizations have always been friendly, the Legion and DMFS are now solidifying their relationship and encouraging collaboration, information sharing and new partnerships at the local and national levels. Partnerships between local Legion branches and Military Family Resource Centres (MFRCs) are already well underway in Newfoundland, Nova Scotia, Alberta and British Columbia. By strengthening their relationship with the Legion, MFRCs have learned more about the Legion’s services, so they have better information to share at their centres. Many MFRCs have also gained a community-friendly space to hold family information sessions. In turn, Legion branches have enjoyed spreading the word about their programs for youth, seniors and the wider community with a new generation of military families. Reaching out to the younger generation is a big part of the Legion’s desire for partnership. Allard hopes that through outreach, the traditional perception of the Legion will shift to recognize that the Legion serves veterans of all ages, including those with military service in more recent operations such as Afghanistan. To kick off the national partnership, hosting Provincial Commands will be inviting select DMFS and MFRC staff to participate in regional service officer training sessions in September and October 2009 in St. John’s, Nfld. and Vancouver, respectively. By including those who work in military family services, the Legion hopes that MFRC and DMFS staff will be able to share what they do with new service officers while learning about the services and support the Legion offers. Allard and Siew also hope the initiative will encourage further partnerships between local Legion branches and MFRCs. “By learning more about each other, we’ll be able to give more informed referrals between organizations and look for new ways we can work together,” says Siew. For Legion members, the Long Term Care Surveyor (LTCS) program continues to be a popular service activity since it was instituted in 2003. In its essence, the LTCS program sees the Legion providing trained surveyors to visit and interview veterans in long-term care facilities at the request of Veterans Affairs Canada (VAC). It also complements branch social visits and provincial command fact-finding in the subject care homes. This year, more than 2,500 veterans residing in almost 700 different facilities are scheduled to be visited. During these visits, veterans will be given questionnaires soliciting their comments on the quality of care they are receiving. These completed questionnaires will then be sent to VAC for information and any necessary follow-up. Past questionnaires show a general pattern of veteran satisfaction with their level of care of accommodation while institutional food remains the biggest challenge. The Legion has also noted with satisfaction that any individual issues requiring the intervention of expert staff have been handled both in a timely fashion and in total confidentiality. Currently, there are approximately 129 Legion surveyors who are available for tasking throughout the country. However, certain urban areas remain underserved. Veterans residing in or around these areas are encouraged to volunteer their services to this program. The areas where new surveyors are needed include British Columbia: Quesnel/Williams Lake, Kamloops, Victoria, and the Sunshine Coast—Powell River, Sechelt and Gibson; Quebec: Montreal, Chicoutimi, and New Richmond/Bonaventure; Nova Scotia: Antigonish, Sydney and Kentville; and Ontario: Thunder Bay, Kenora/Dryden, North Bay, Parry Sound, Scarborough/ Toronto, Brampton, Kitchener/Guelph, Gravenhurst/Bracebridge and Perth. Courses for Legion surveyors occur approximately three times a year to either train or re-qualify volunteers. The location of the specific training is usually determined by the geographic area where the demand for trained volunteers is greatest. 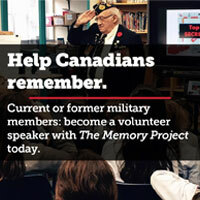 This year training courses for Legion volunteers were held in Montreal and London, Ont. This fall, we anticipate a training course in Montreal and one in Vancouver in the spring of next year. These two-day courses provide Legion volunteers with background information on VAC, the latest developments at the Legion and LTCS program as well as the knowledge and skills required to conduct a proper interview and submit detailed reports on the veterans interviewed to VAC. It should be pointed out that the volunteers are reimbursed for their out-of-pocket expenses when on assignment.